Brazil, a growing nation in importance in foreign policy circles and world capitals is increasingly eyeing Africa in expanding its influence and businesses. Brazil is launching a top-level drive to expand its economic ties with Africa, a sign of how crises in the rich world are pushing faster-growing emerging economies to trade and invest among themselves.The new initiative, ordered by President Dilma Rousseff after her three-country trip to Africa last month, comes as nervousness grows in Brazil over the impact in the coming months of Europe’s debt crisis and lurch toward recession.Europe’s woes, combined with anemic growth in the United States, are already dampening demand for Brazilian exports and will make it more difficult for Brazil to rebound from disappointing growth of around 3-4 percent this year.In contrast, the eight most promising emerging economies in sub-Saharan Africa, not including South Africa, have grown by an average of 6.6 percent per year over the past decade, according to Deutsche Bank. That is about the same rate as the BRIC group of big emerging countries Brazil, Russia, India and China and faster than emerging Asian economies.Africa’s total share of Brazil’s trade remains small at just over 5 percent but Brazil has rapidly grown its footprint in the region in recent years as it tries to catch up with China’s burgeoning investments and influence there. Brazilian President President Dilma Rousseff with South African President Jacob Zuma. “The crisis has accelerated this strategy,” Pimentel told Reuters. “There will be a dispute for economic space in Africa, and Brazil has to be positioned there.” Pimentel will lead government officials and business executives this month on a 10-day mission to explore opportunities in the three countries that Rousseff recently visited – Angola, Mozambique, and South Africa. The new thrust builds on progress made under former President Luiz Inacio Lula da Silva, who visited at least 25 African countries and doubled the number of embassies in the region as he looked to establish Brazil as a leader of the developing world. Brazil’s overall trade with Africa has quadrupled since 2002 to $20.6 billion last year, compared to its $82 billion trade with the European Union. The fast-growing ties are overwhelmingly based on the exploitation of commodities as Africa taps Brazilian firms’ expertise in mining, oil exploration and tropical agriculture. Mining giant Vale (VALE.N) opened a $1.7 billion coal mine in Mozambique in May that Pimentel said would give a $1 billion boost to Mozambique’s trade balance next year. Brazilian construction firm Odebrecht is the largest private employer in Angola, with activities including food and ethanol production, factories and supermarkets. Petrobras(PETR4.SA), Brazil’s state-controlled oil company, is active in Angola in deep-water drilling. Brazil sees a growing market for its services and goods related to such investments. BRAZIL’S TRUMP CARD – BEING NICE Almost half of sub-Saharan African exports now go to emerging and developing markets compared with less than a quarter in 1990, according to the International Monetary Fund. China alone accounts for about 17 percent of the region’s trade, with India and Brazil accounting for 6 percent and 3 percent respectively. Skeptics say Africa’s low level of business diversity and its relatively small economic output limits its potential to become a major trade and investment partner for Brazil. “It’s still a very small market, income is very concentrated and the space for advance is small,” said Bruno Lavieri, an economist at Sao Paulo consultancy Tendencias. “Even in the long term it will take decades for Africa to be really an important player in Brazil’s trade.” Brazil has also struggled to match China’s financial clout in the region as Beijing backs its companies with generous subsidized loans. Jinchuan Group, China’s dominant nickel producer, outbid Vale this year when it bought South African mining firm Metorex for more than $1.3 billion. Pimentel said his group would be looking at creating new financing mechanisms to support Brazilian projects. But Brazil believes it has a trump card against China that it intends to play in its new economic push — put simply, that it treats Africans better. Chinese firms have been accused of flouting worker safety laws in some African nations and have also been criticized for importing Chinese workers rather than hiring locally. “This is our big selling point – that we are arriving in these countries doing more than just selling products and services,” said Pimentel. “Brazilian companies have a good image in Africa. This compensates for our fragility in financing compared to China.” Brazil’s shared Portuguese language with countries like Angola and Mozambique, ethnic ties, a common history of colonialism and Brazil’s success in alleviating poverty and hunger at home also help its brand on the continent. Embrapa, Brazil’s agriculture research agency, has operations in four African countries where it is transferring its technology and expertise in raising crop yields that helped turn Brazil into a tropical farming powerhouse. Rousseff said during her trip that a pharmaceutical plant being financed and assisted scientifically by Brazil should start next year making cheap anti-retroviral drugs to help Mozambique’s fight against AIDS. Even with competition from China, Africa’s rich and largely untapped resources mean Brazil still has huge potential to expand its presence, said Jorge Heine, the CIGI chair in global governance at Canada’s Balsillie School of International Affairs. “Given Brazilian needs and the abundance of natural resources in Africa, it is by no means evident that we are near the limit of the volume of trade between Africa and Brazil,” he said. Brazil is interested in looking for new markets to diversify it’s economy, which is oriented towards the U.S., Europe and China. As a BRIC nation as well, it is strategically trying to position itself as a player on the international scene. Hence it following in the foot steps of follow BRIC nations Russia, India and China. As most nations, Tanzania is always looking for new ways for economic development. Natural gas just might be the answer for Tanzania. For UK based gas specialist Eng. Teddy Chungu, the success of the ongoing construction of a natural gas distribution pipeline for compressed natural gas (CNG) from Ubungo to Mikocheni by the Tanzania Petroleum Development Corporation (TPDC) will only be pronounced when gas flows into the distribution pipeline and residents of Mikocheni are able to utilise natural gas for domestic and industrial purposes. According to the international gas specialist, 57 houses at Mikocheni will soon be lit with natural gas. Ultimately, we will see industries at the Mikocheni Light Industrial Area use natural gas to power their boilers. Eng. Chungu says, “This will be a success – It will be a signal that all parties involved are committed to tap into the country’s virgin natural gas reserves.” True to his word, the mega natural gas distribution project undertaken by main contractor, BQ Contractors Limited in a joint venture with UK based Excellium Construction Limited is near completion courtesy of the quality partnership between the client and the contractor. And the involvement of experts like engineer Chungu has incredibly proved credible in the transfer of knowledge and technology to local work-force but mainly underlined on BQ’s enterprising experience as a trusted partner in the expanding fuel and gas industry. With expectations running high on the achievements made by natural gas exploration companies, Eng. Chungu feels that the discovery of virgin gas reserves in the country is an enormous stimulant to economic development in Tanzania. While natural gas is set to become a major source of energy and fuel, the engineer notes that Tanzania has the ability to export natural gas to other countries, especially to Europe which is currently experiencing depreciating reserves. Natural gas might attract foreign investment in the energy sector if the outcome is viable. That depends on the infrastructure for extraction, shipping the gas domestically and abroad. An opportunity has presented itself, and it is up to the Tanzanian government to layout the right plan. Egypt looking to buy submarines from Germany? Based on news reports, Egypt is in the process of buying German built submarines. But he declined to comment on the supposed deal, saying the government maintained secrecy concerning matters dealt with by the Federal Security Council, a government committee that decides on sensitive weapons export deals. If this defense deal is finalized, the submarines will give the Egyptian navy a new dynamic in the region. Having such a weapon system will surely increase Egypt’s power projection in the region, especially towards Israel and Saudi Arabia, with the only the U.S. having superior capabilities. Egypt’s small navy has four aging Chinese-built Romeo-class Project 633submarines acquired in the 1970s. These were to have been replaced years ago but financial constraints delayed the move. Germany has been looking to expand its arms exports in region and this showcases how defense exports have become important for western nations amid shrinking defense budgets. Compared to France, Russia, U.K. and U.S., Berlin lags behind. This will also give Germany a chance to enhance its strategic position in the area. 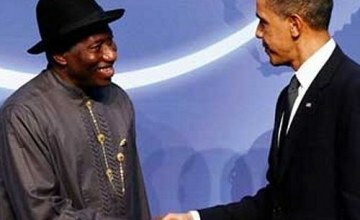 Presidents Goodluck Jonathan and Barack Obama shake hands at the Nuclear Security Summit in Washington in 2010. Nigeria is the next economic giant American President Barack Obama recently said. United States President Barack Obama has declared Nigeria as the world’s next economic success story, stressing that this was one of the major reasons why his government was committed to helping the country build strong democratic institutions and remove constraints to trade and investment through the African Growth and Opportunity Act. Making this declaration at the ongoing US-Nigeria Trade and Investment Forum, an event organised by the Nigerians in Diaspora Organisation (NIDOA) in Washington DC, yesterday, Obama who was represented by Ambassador Eunice Reddick, said that his country expanded opportunities for Nigeria to effectively access markets and diversify its economy beyond a narrow reliance on natural resources. “As we support these efforts, the Diaspora can play an important role in contributing to a strong, vibrant and economically prosperous Nigeria” he noted. Obama said his country was investing in Nigeria’s success because it recognises her as a strategic center of gravity, whose success would as well be Africa’s success. The US leader also made it known that his government would encourage Nigeria in the area of private investment in the power sector as well as other sectors to help seal the promise of growth and opportunity for all Nigerians. He added that the US government would also work to strengthen Nigeria’s agriculture sector, which employs nearly 70 per cent of the country’s population, by encouraging improvements in infrastructure that would facilitate agricultural growth. America would help to liberalise Nigeria’s trade policies to foster regional trade, reform the customs system to bring it in line with global best practices, and also encourage policy reforms to enable private investment in agriculture. Speaking on the US-Nigeria Bi-national agreement, Obama said that the joint Commission has grown into a forum for frank, high-level conversations in which both nations have seen substantial reforms and mutually reinforcing initiatives implemented in Nigeria. “Energy and Investment, the subject of one of the four working groups of the Binational Commission, is critical to Nigeria-s present and future”. I agree that the potential is actually there, the only problem Nigeria has to live up to that potential. That starts by improving the country’s infrastructure from roads, telecommunications, solving the Niger delta problem and simmering down ethnic and tribal differences among the provinces throughout the nation. The formula is there for great economic success with the right leadership.